Consult this oracle based in ancient wisdom and receive the answers to your modern problems. Features a full moon cycle of lunar images, each beautifully illustrated and able to be used as stunning circular altar displays. Experience the seasonal moons and the power they can provide. 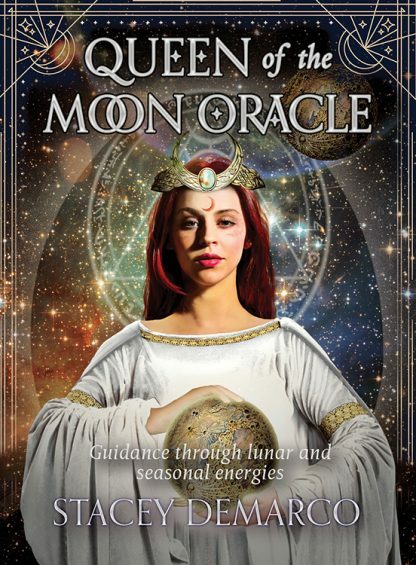 Learn which times in the moon�s cycle are best for ritual, spell craft and making talismans for prosperity, love, health and more. This is the perfect companion to the author�s best-selling annual Lunar and Seasonal Diary and is perfect for anyone who loves to sit or dance under a big silvery moon. Stacey Demarco, one of Australia�s most trusted metaphysicians and spiritual practitioners, is a foundation member of the Australian Psychics Association and a board member of the Pagan Awareness Network. Kinga Britschgi is a professional Hungarian artist having been living in the U.S. since August, 1995 and works in both digital and traditional media creating mostly composite works for narratives, illustration, fine art prints, and such. Visit her at http://kingabrit.wixsite.com/kinga.